It's no secret that this family loves animals. 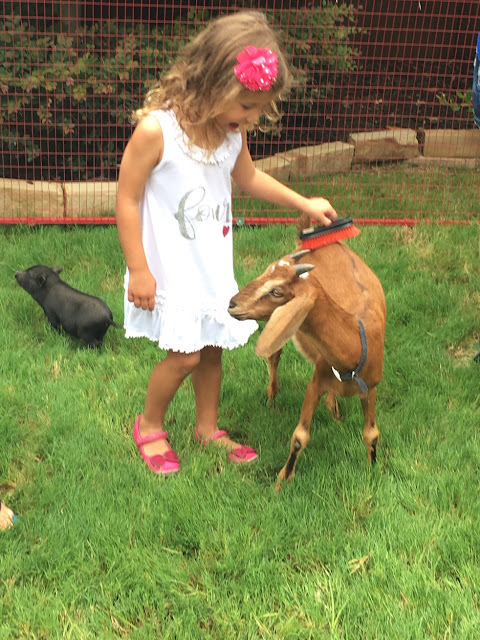 The girls' past birthday parties have included dolphins and sea creatures for their third Under the Sea Party and a backyard petting zoo for their fourth "Party Animal" themed birthday. 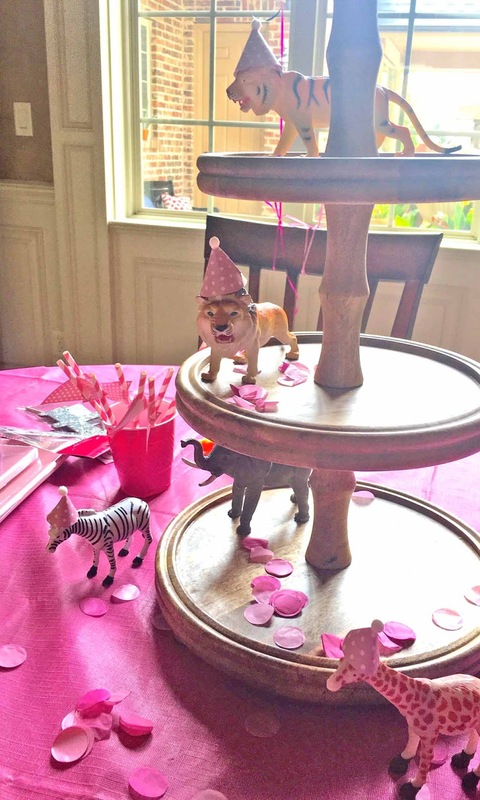 When it was time to plan their sixth birthday I was not at all surprised when they asked for a puppy and kitty party! In fact, I was excited to get this "pawty" started! We are big supporters of rescue animals and adopting, so it was only fitting that we tied this into the birthday party. The DFW area is full of many wonderful pet rescues but one that is close to my heart is Dallas Dog Street Advocates. Two of the founding members matched us up to our beloved dog, Baloo, two years ago. I have been so impressed with the organization and the work they do that I have continued to help and support them anyway I can. You can visit their page and read more about what they do here. In lieu of birthday gifts, we asked for donations to the rescue. Over $300 was raised and two large bags packed full of dog supplies were given that day. Thank you again to all who donated! And rest assured the girls also received birthday gifts from family. Upon entering the front door, we had a table for donations and paw print stickers on the floor leading the way to the fun. You can find these paw print stickers at Oriental Trading. The first stop was the family room where Elise from Dallas Dog Street Advocates took the stage. She talked to everyone about what the organization does and showed the girls pictures of dogs available for adoption. Elise also brought a puppy to play with! Sweet and sassy Cassie got a lot of attention from the girls, and Baloo was a polite host to her. Cassie has since been adopted, but DDSA does haveother puppies for adoption! After Elise and Cassie packed up, the girls headed over to our Adoption Center! 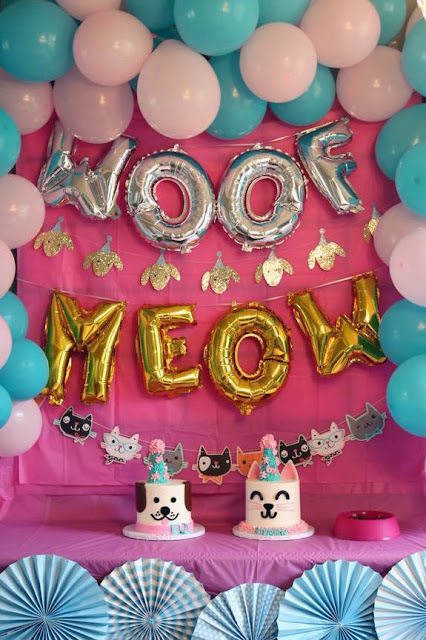 Each guest chose a puppy or kitty of their very own and a balloon dog. These adorable dogs had a leash and floated right along with their new owners. The puppies and kittens are ready to "paw-ty" too! 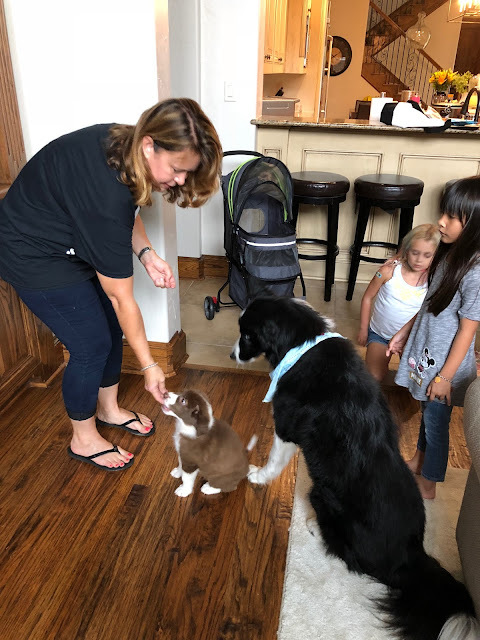 With the new pet, each girl received pet vitamins (jelly bellies), dog bones (Scooby Doo snacks) for the pups, and cat treats (goldfish) for the kitty owners. Once the girls chose their pet, they decorated a pet carrier..
Don't forget your kitty ears and whiskers! I considered hiring someone to do the face painting but in the end I decided to give it a shot. It was completely amateur work but the girls were happy. I did puppy dog face paint for those who wanted it after looking on Pinterest for a quick tutorial. The girls had so much fun with the face paint, they took over and were doing each others faces. Lunch was simple and consisted of a hot dog bar, "paw-ta-to" chips, fruit, and veggies. Lemonade and ice tea for beverages. The cakes turned out just the way I hoped they would and tasted fantastic! Vanilla cake with vanilla butter cream filling and chocolate cake with peanut butter filling! Puppy and kitty cake pops were on the desert table along with "dog food" (Whoppers chocolates) served in a pink dog food bowl. Another successful party in the books with sweet friends! Thank you to all who helped celebrate with the girls! And thank you to Elise with Dallas Dog Street Advocates for coming out and bringing Cassie! This is amazing! Every purr-fect little detail - a "tail-wagging" success! This is such a great party and I love that you are teaching your girls the value of donations. Such an important lesson that no matter how old we are we can still make a difference!